It was a usual wonderful summer morning at outskirts of Thol Bird Sanctuary until we notice this beautiful snake swimming swiftly in one of the small pond, well hidden in vegetation. And our morning become most unusual when we saw snake hunt a toad… it was heart stopping and scarier….! We were busy in bird photography when we register some light movements between the water plants. Instantly we locate Indian rat snake-eyes already fixed on us…it seems like snake locate us before we can…! We know it is non-venomous but we also know rat snakes can give a painful bite and quick to defend, we just stick to the same place. After some time its slide away very fast and disappears. Only to reappear with freshly caught toad from muddy water. 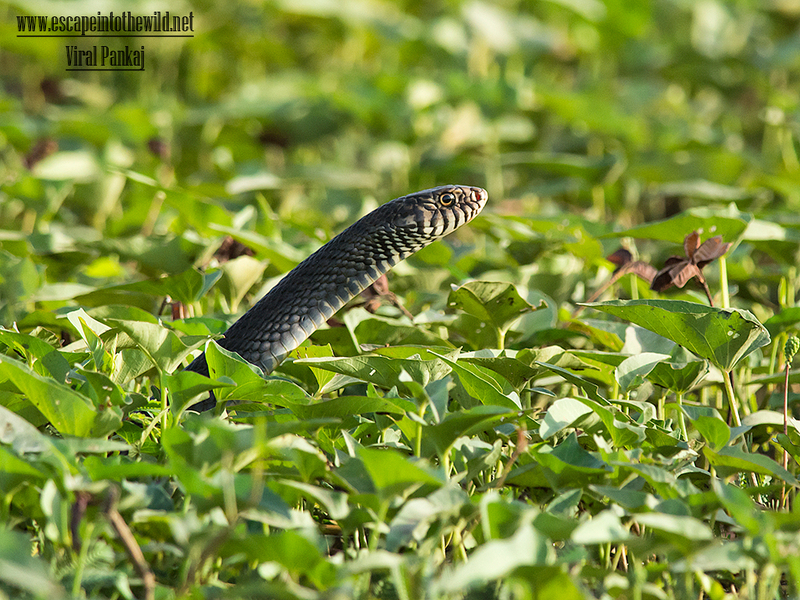 Indian rat snake hunts by moving fast with its head high above the surface. Black interscale stripes are visible on the underside at this time. We heard the large one growl using throat when Indian rat snake resurface before small mournful ‘mow’ sound made by dying toad. Indian rat snake was eating a live toad and this isn’t hurting it. Actually rat snake was using body weight to weaken toad while swallow it very slowly and deliberately. This Dil-dhadak show was over just in few minutes. After swallowing the whole toad, snake quickly crosses the trail which was exactly situated in front of us. We can clearly see uneven skin and big lumps made by eaten prey in snake’s body. Finally Dhaman was rapidly slide towards dense bushes to hide. Ptyas mucosa, commonly known as the Oriental rat snake, Indian rat snake or Dhaman is a common species of colubrid snake found in parts of South and Southeast Asia. Dhamans are large snakes, growing to 2 m (6.6 ft) and occasionally even to 3 m (9.8 ft). Their colour varies from pale browns in dry regions to nearly black in moist forest areas. Dhamans are diurnal, semi-arboreal, non-venomous, and fast-moving. Dhamans eat a variety of prey and are frequently found in urban areas where rodents thrive. 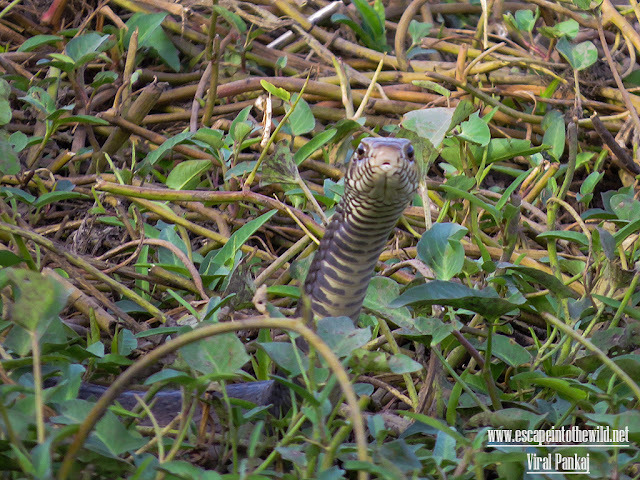 Though harmless to humans, Dhamans are fast-moving, excitable snakes attempting to strike at passing objects. They are large, which grow to a length of 2 ½ meters or more; found wherever rats and frogs/toads are prevalent. So, they are often found in rice fields and in human habitation. Appearance and behaviour of Dhaman is misinterprets in human settlements, as for a venomous snake and usually get killed. Venomous or non-venomous we surely bet most of you know the consequences of a snake that is sighted by humans. Non-Venomous snakes like Dhaman are obviously harmless and helpers to farmers, which is hard for common man to believe, as they consider any snake as lethal…deadly… concluded in be sure to kill…. !